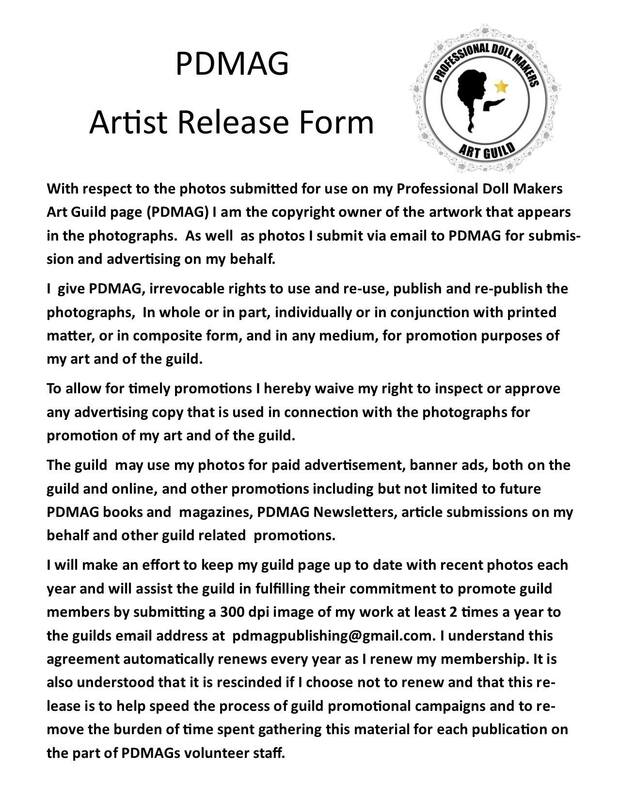 Please fill out all required fields of your application and send 5 photos of your original artwork with 2 close up photos (one of the hands and one of the face) to pdmaguild@gmail.com. Please allow us time to fully review your application and photos, once it has been reviewed you will receive an e-mail from PDMAG. Thanks for your interest! Welcome We would like to thank you for your interest in becoming a member. PDMAG has been in the business of promoting and educating exceptional world class doll makers from around the world since 1991. We would love to hear from you. Please be sure to fill out all lines below and read all instructions with red text to make sure we are able to expedite your registration quickly. For Office use only. Home address, Contact number and paypal email are required but will only be visible on the private section of your profile and to admins. This will not be on your public profile *The paypal email is for billing and payment purposes and if you participate in our Tutorial sales or future online doll shows. READ: This should be your personal page. Use the entire URL. (ex. http://www.facebook.com/your.name.12) We do most of our communications via Facebook. We have workshops groups and public Facebook groups and the apprentice academy groups are also on Facebook. If you do not have a facebook account we recommend you open one before you register. You do not need to add anyone other then our President Cherie Fretto so she can add you to those groups. If we can not find your page and add you as a friend we can NOT add you to the groups and keep you aware of upcoming events. That is how FB works if you are not a friend we can not add you to the groups. copy and past the URL for your personal page here. I have read and agree to the above Artist Release Form and by typing my name here i agree to the terms therein. Please check the I'm not a robot box before clicking the blue register button. Submit application by clicking the blue register button. You will get an automated confirmation that we received it. Submit 5 photos of your original artwork including 2 close up photos (one of the hands and one of the face) via email to pdmaguild@gmail.com for review. Wait for your email from PDMAG with instructions. Login using your user name and password you created when you filled out the password. Set up your password protected personal profile then add your doll photos and bio to your profile page. NOTE: If you are a new member and have not received your email yet. Do not pay your membership fee until you receive your approval email. You will receive that email as timely as is possible. You will be prompted to pay your membership in your acceptance email. If you have not heard back from us within 7 days please email us pdmaguild@gmail.com. Thanks for your interest in PDMAG!